Applications will be accepted beginning Dec. 10, 2018. This program is for current junior students only. Applicants should be seniors in the 2019-2020 school year. The application deadline is March 25, 2019. One letter of support from another teacher, your principal, guidance counselor or other mentors who can describe your personal character or interests. Email letter to Teddi Freedman, Program Organizer, at esp@uwyo.edu. You'll work one-on-one with faculty members and advanced students. This one-week program will expand your horizons, develop creative thinking and problem-solving skills and challenge your imagination. Students who are interested in any career are encouraged to apply. The field of engineering can prepare you for advanced degrees and careers in medicine, law, business, as well as the various fields in engineering. Hosted on the UW campus, you'll be in some of the best labs in the West. Only 36 students will be selected to participate in the program. The cost for students accepted into the program will be $300. 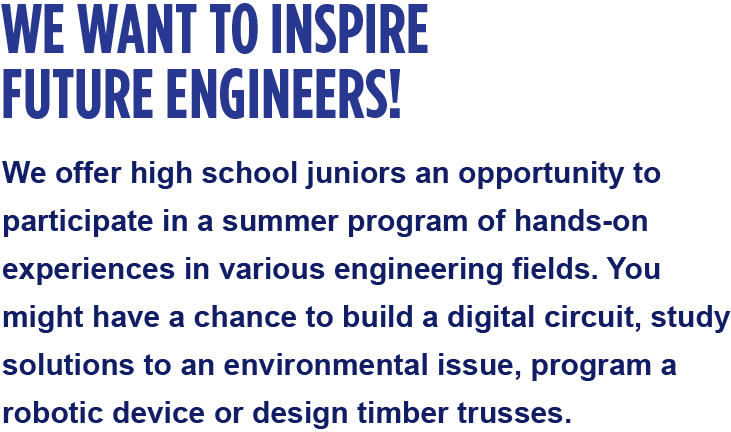 All other program costs are provided by the College of Engineering and Applied Science and the Wyoming Engineering Society. So much appreciation goes out to our fantastic sponsors, which include Union Wireless, Ellbogen Next Generation Engineering Program, College of Engineering and Applied Science, Halliburton Foundation, Kester Funding, Wyoming Engineering Society, and the Kennedy Endowment. The program is open to any student, both in Wyoming and out-of-state. If you require additional information, contact Teddi Freedman at 307-766-4236 or esp@uwyo.edu.